The Reefs, one of the top Bermuda properties on “Travel + Leisure’s” T+L 500 list , this week welcomed Jason Koppinger as its new executive chef – promising he’d spice things up at the the resort’s three restaurants by infusing a multicultural style into new menus and offering interactive culinary experiences. Overseeing the South Shore hotel’s talented culinary team, Chef Jason is an acclaimed culinary professional. He has appeared along Food Network superstar Bobby Flay in “Iron Chef America: Battle Broccoli,” the “Chopped” TV series and holds top credentials from The Culinary Institute of America, the American Culinary Federation and The French Culinary Institute. In 2006, Chef Jason made history when, at the age of 30, he became the youngest Certified Master Chef in the US - - the highest professional distinction and one that only 66 chefs have earned. Born in New York City, and raised in Trinidad and Orlando, Florida, Jason has travelled throughout the Caribbean, Latin America, the United States and the South Pacific for his career. 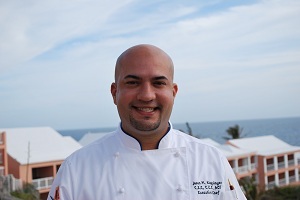 Prior to joining The Reefs in Bermuda, Chef Jason was the executive chef at the Westin Casuarina Resort and Spa in the Cayman Islands where he earned the honor of Chef of the Year on Grand Cayman. His extensive culinary experience also includes executive chef positions at The Outrigger Keauhou Beach Resort on Kailua-Kona, Hawaii, and Royal Caribbean International. At The Reefs, Chef Jason will draw on his diverse ethnic background to create unique dishes that are exciting in flavour and presentation. “I am especially influenced by the flavours and diversity of Asian cuisine, which I try to blend into locally-sourced foods and seasonal offerings,” comments Chef Jason Koppinger. In addition, as a Certified Culinary Educator, Chef Jason plans to teach guests and residents about food and wine from around the world in The Reefs’ show kitchen. “It’s fun to play with food and I love to educate people to show them what they can do,” adds Mr. Koppinger. On behalf of The Reefs, I want to thank you for your comments. We, too, share your excitement for the new Chef and menus. The new menus are currently in development, and you can expect to see them in our dining venues by late spring. If you would like to stay more informed of the dining changes as well as local specials, I invite you to sign up for our local e-newsletter “Be Our Guest”. We look forward to welcoming you back to dine with us again.